Peter discussed Robert Louis Stevenson's novel 'Kidnapped' with Mark Stephen of BBC Radio Scotland in a programme broadcast on the 'Out of Doors' programme on Saturday 15th and Sunday 16th September 2012 . In chapter 24 and 25 of the novel, the fictional David Balfour with Alan Breac Stewart travel from Rannoch to Balquhidder and meet with Robin Oig MacGregor. We considered the nature of the glen in the early 1750s, the people, and why Alan Breac and Robin Oig may have been hostile when they met. 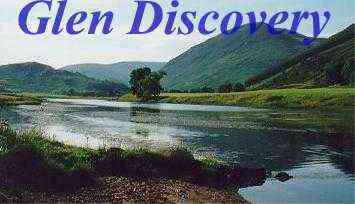 Rob Roy MacGregor, father of Robin Oig, fought a duel in 1734 with Stewart of Invernahyle, kin to Alan Breac. On the death of Malcolm MacGregor of Marchfield whose lands included Invernentie, one of the MacLarens took over Invernentie much to the annoyance of Rob Roy who had intended placing one of Marchfield's kin on the farm. Rob Roy raised a number of armed MacGregors to drive MacLaren and his friends off the property, but the MacLarens brought in two hundred Stewarts of Appin, led by their chief, Stewart of Ardsheal. Rob Roy conceded to the superior force but the young Stewart of Invernahyle offered single combat to Rob Roy to satisfy honour. At the age of 63, Rob Roy was past his best, and after a wound in the arm, conceded to the younger man. However, the wound became infected and he died not long after. Two years later, in 1736 Robin Oig, then aged 19, shot and killed MacLaren of Invernentie. In December 1751, after deserting from the British Army following the battle of Fontenoy, and serving as an officer in the Jacobite army during the '45, Robin Oig, with his brothers' assistance, kidnapped and forcibly married Jean Key, a young widow from Edinbellie, near Balfron. Her relatives raised a legal action against them; as a result both James Mor and Robin Oig were outlawed with a warrant of fugitation in 1751. Stephenson set his fictional story immediately following the murder of Glenure on 14th May 1752. While is is possible that the real Robin Oig could have been in Balquhidder in 1752, perhaps visiting his brother Ranald who farmed and was the innkeeper at Kirkton of Balquhidder, his whereabouts were unknown to the authorities (and history) until he was reported in Balquhidder at the begining of May 1753. At the end of May 1753, the real Robin Oig was arrested. He was tried and hanged in Edinburgh at the start of 1754. His brother James Mor, had escaped in November 1752 and fled to France. The escape of James Mor was dramatised by RLS in his sequel novel 'Catriona'. Alan Breac and the noted outlaw Sergeant Mor Cameron have both been suggested as the murderers of Campbell of Glenure, but according to Campbell of Barcaldine, James Stewart of the Glens had offered a reward and commission in French service to Robin Oig if he would kill Glenure. However, Barcaldine's source for this had been James Mor himself, in August 1752, while imprisoned in Edinburgh tolbooth as part of a "plea bargain" for his release. Click here to listen to a BBC podcast of part II of the narrative, Glencoe to Corstorphine, by Mark Stephen. All title, ownership rights and intellectual property rights in and to the BBC Podcasts shall remain the property of the BBC. For the development of the kilt click here for my article on the clothing of our ancestors. See also the article on Ancient Highland Dress by the Scottish Tartans authority. How did Scottish Highland dress transform from an illegal garb to one worn by kings? 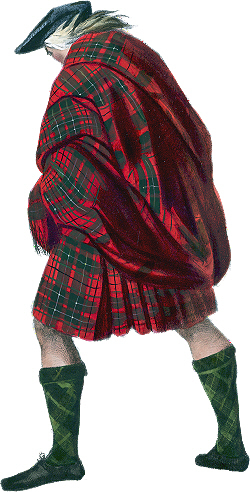 The legislation against Highland dress was repealed in 1782. 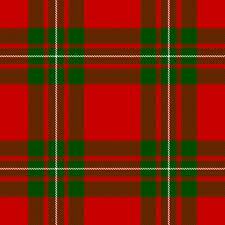 From then on every family in Scotland had to have its own clan tartan made by the woollen weavers of Lowland Stirlingshire and Clackmannan. Most modern tartans (with a few exceptions) date from this time or after. The process is by no means complete and it is common today for companies and institutions in Scotland to have their own tartan. Although I am descended from a number of Highland clans, my male line 'Lawrie' ancestors lived in Banff in the 17th century. One of them, James Lawrie, was taken "in arms with the rebels" of the Jacobite army, defeated at Culloden in 1746. Other Lawrie families in the 16th to 18th centuries were found in the Lothians, in Lanarkshire and in Dumfries (the famous Annie Laurie of Maxwelton). One of my distant cousins has designed and registered a 'Lawrie' tartan and I have used it as a background with his kind permission. The outfit on the right is from a portrait in the possession of the current clan Chief, Sir Malcolm MacGregor, Bart. This was worn by his ancestor Sir Evan MacGregor Murray, 2nd Baronet as commander of the MacGregor Guard of Honour during the King’s visit to Edinburgh in 1822. 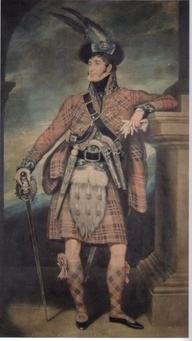 It should be remembered that from 1603 to 1775 as a result of the proscription of the Clan Gregor, it was illegal to be even called MacGregor, or for a MacGregor to possess a weapon, never mind parading in front of the monarch in a costume which would have earned exemplary punishment little more than a generation earlier. On the left is an outfit made for an unknown gentleman to be worn during the 1822 festivities. As vice-chairman of The Clan Gregor Society, I usually wear a MacGregor kilt. The jacket is a replica of an 17th century slashed doublet, while the sporran is similar to 18th century designs. My MacGregor connection is through my paternal grandmother who was a descendant of the MacGregors of Glen Gyle. 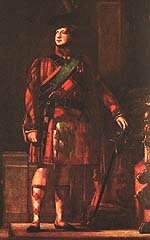 In fact we descend from the nephew of Rob Roy MacGregor, Gregor ghlun dubh (black knee) who was a lieut-colonel, commanding one of the two MacGregor regiments in the 1745 rising. 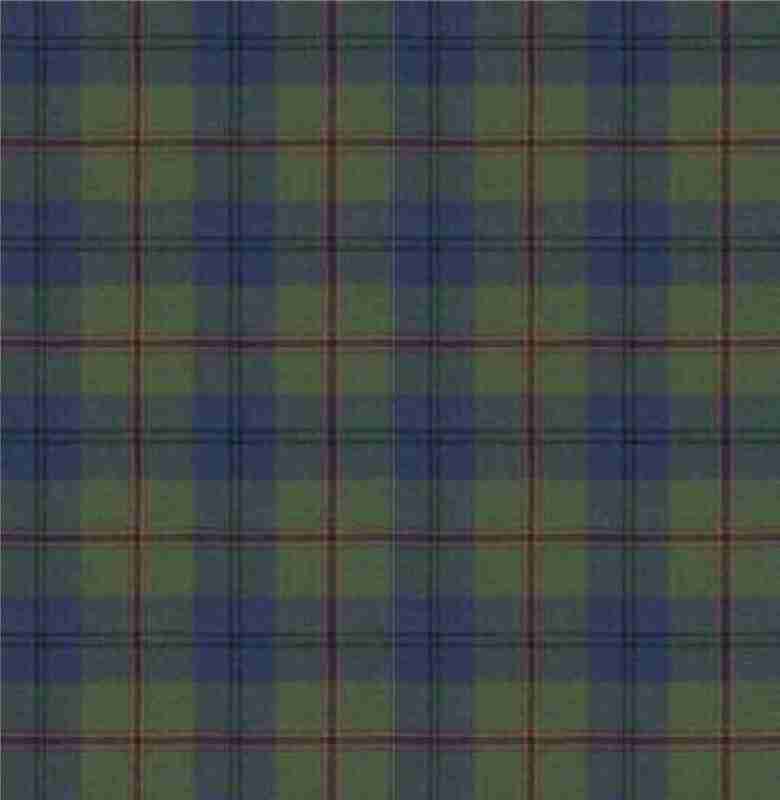 The tartan on the left is a variant with a more muted red. 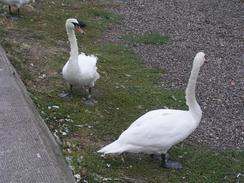 Curious swans at Broughty Ferry, wondering where the Pelican came from. - But not nearly as curious as the flock of twitchers following its every move! Broughty Bits & Bytes - for support of servers, workstations and networks. Home users too.